With NightHawk newly reformed and preparing for a world tour, Abi Hawk finds herself unaccountably insecure about the attention her husband Gideon, the band's frontman, will receive from groupies. In New Zealand for the first leg of the tour and a visit with Gideon's sister, they are faced with a new problem. An outrageous claim pushes Abi's insecurities to new heights, and it takes all their resolve to stick together and sort it out. Meanwhile their daughter Natasha goes on an adventure of her own, one that places her in danger from an old adversary, forcing Abi and Gideon to summon all their combined strengths to rescue her. I emitted a little squeal of excitement when I received an email from Rachael Richey, offering me a review copy of the next instalment in the Nighthawk series. Having read Storm Rising and Rhythm of Deceit, I have been secretly looking forward to this next instalment. 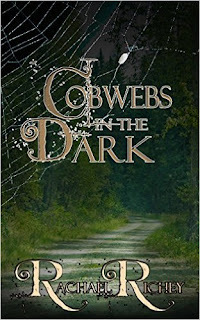 Although you could read Cobwebs in the Dark as a stand-a-lone, you should really read the two prior novels to fully understand the history of Abi and Gideon, and also because they are brilliant entertaining books that you should not miss. Rachael’s writing style flows so easily that she effortlessly moves from past to present, revealing just enough information each time and leaving the reader clamouring for more. This ensures that the reader voraciously devours every page and constantly reads ‘just one more chapter’. The Hawks are written with so much warmth that I felt as if I was a part of their family. What I found so brilliant about this book was the almost ‘Back to the Future’ feel of it – all of the nearly moments when Abi and Gideon might have run into each other in the past. I felt like Marty McFly spying on his parents where a tiny alteration to any moment in the past could have changed the course of their history. It was quite sad how close they came to meeting again but who knows, perhaps they wouldn’t still be together if they had met back then. It was interesting to learn more about Natasha’s history in this book along with another appearance of Psycho Simon - I couldn't read quick enough to find out what he would come up with next. This was another treat from Rachael Richey - I feel like I'm part of the Hawk family myself. I always feel a little sad when I finish one of the Nighthawk books but Rachael leaves a little treat in the last few pages - a tantalising snippet of the next book, so I know I'm going to be reading more soon! I received this e-book from the author, in exchange for an honest review.